Serbia showed tremendeous performance against Denmark 30:25 (17:13) to secure two points for the Main Round. All three teams will take two points in the battles with France (2), Russia (4) and Montenegro (0) for the semi-finals. Denmark: Trine Østergaard 6, Fie Woller 4, Kristina Jørgensen 4, Stine Bodholt 3, Anne Mette Hansen 3, Mette Tranborg 2, Lærke Nolsøe 1, Kathrine Heindahl 1, Mie Højlund 1. Serbia: Katarina Slezak 8, Andrea Lekic 8, Jelena Lavko 4, Jovana Stoiljkovic 4, Sladana Pop-Lazic 3, Dragana Cvijic 2, Dijana Radojevic 1. 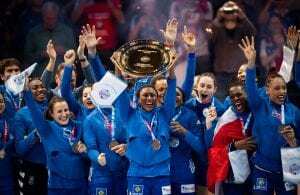 French girls take European crown for the first time!